Hereford United will be looking for some revenge over Burton Albion tomorrow after the Brewers beat the Bulls twice last season. Burton currently lie seventeenth place in the Conference but have won two and drawn one of their five away games to date. However, despite their lowly position they are the only team in the league to have defeated leaders Barnet at Underhill. They have also beaten Stevenage away and claimed a point away at Carlisle in front of Sky TV cameras. The Brewers have Nigel Clough as their manager and he still plays regularily for his team. Also on the books is former Hereford United captain Ian Wright, but he has been suffering with injuries for most of the season so far and is unlikely to feature tomorrow. Andy Corbett may return to the squad as he is back in training after picking up a knee injury, but captain Darren Stride has fractured his cheek bone and is a major doubt. Sam Shilton, who has a hamstring injury, and Dale Anderson (groin strain) are also doubts. Burton did not feature in the LDV this week, which will have given their players seven days to recover from the 2-0 defeat by York last Saturday. Clough is working with smallish squad though and may be forced to name one or two not quite fit players on the bench. Clough told the Derbyshire Telegraph earlier this week that he had to play four players last Saturday who were not fit. "We've played the last three weeks with the same 13 or 14 players. The effort was there but there just wasn't an awful lot in the tank. "Now we have a clear week. It'll give the lads who've been playing a rest and we'll try to get a couple of others back on the pitch. We're delighted with the points tally in the last three weeks and we'll try and pick it up again at Hereford." As reported yesterday, Hereford United will be without Ryan Green and Jamie Pitman for the match. Although Rob Purdie has resumed training he isn't expected to be in the starting line up but he may be in contention for a place on the bench. Tony James could return to lead the team if he comes through a late fitness test. James may be the only change that Graham Turner makes to the team that started the LDV game on Tuesday, when the Bulls last played and, after extra time, defeated Scunthorpe on penalties. With Hereford United undefeated in their last four Conference games, they will be looking to extend the run. The Brewers though, have reason to be confident after some very good results against sides well placed in the league and with their successes over the Bulls last season. Bobby Gould, father of Hereford United goalkeeper, Johnathan, quit his coaching post at Peterborough in the middle of their LDV game at Bristol City last night. Posh were losing at half-time but Gould failed to reappear for the second half. Manager Barry Fry told the club's official website: "I should imagine I have had the worst month personally in my life - and that took the biscuit. "There is not a rift as far as I am concerned. I applaud him for everything he has done. This has completely knocked me over, but he has done it before." Bobby Gould lives at Portishead, close to Bristol. Nearly all of Hereford United's squad are likely to be available for Saturday's game against Burton. Graham Turner gave this news to BBC Hereford and Worcester this afternoon. "Purdie has had a long and difficult period with a couple of injuries, but he joined in training for the first time for sometime on Monday. "Tuesday's match came too early to be considered in that, but he is now fit and should be in contention fairly soon. "Tony James missed Tuesday's match with a thigh problem. I expect him to be in contention for this weekend. "Jamie Pitman will be missing, Ryan Green will be missing, so at the moment the injury situation doesn't look too bad." Tony James is rated a major doubt for Saturday's game against Burton Albion according to the Hereford Times. Jamie Pitman is also doubtful but Rob Purdie is said to have started training again. Meanwhile the light has been repaired in the Meadow End toilet. Chester, Accrington and Blackpool won their first round games in the LDV North tonight. They join Carlisle, Hartlepool, Huddersfield, Doncaster, Macclesfield, Mansfield, Wrexham, Port Vale, Rochdale and Stockport and Hereford United who went through last night. A home draw for the Bulls against Wrexham or Chester would make an exciting prospect. Darren (Dazzo) Williams is to have his next fight at the Leisure Centre, Hereford on Friday November 5th. The Hereford United supporter will be trying to defend his UK featherweight title against John Simpson from Glasgow. Tickets will be available from Monday October 11th for the fight and will cost £25 and £40 (ringside).Details from either 01432 344546, 01432 360813 or 07966512527. Dazzo left Hereford yesterday for Tenerife for two weeks altitude training. Hereford United supporters are expected to take a fair number of the thousand or so tickets. For those who are unable to be there, Sky TV are covering the fight. Graham Turner, the Hereford United manager, thought his side deserved the win against Scunthrope last night. "It would have been a real setback for the lads had they been knocked out on penalties," Turner told the Evening News. "I'm really pleased for the players, especially the younger ones. "Danny Carey-Bertram scored the winning penalty but he has not had a lot of first team action this season. It showed good strength of character for him to step up and take the penalty. It takes a lot of nerve to do that. "I thought we were the better side overall. It was a very disciplined performance from us and it was almost a cultured game. "We defended quite well and we let them have a lot of the ball in certain areas. But we kept our shape well and they did not harm us too much. "Craig Stanley scored an excellent goal to put us in front, it was a terrific strike. But we should have scored more than just the one goal. "We had a couple of chances in extra-time to put the game to bed." Hereford United will find out who they are drawn against in the second round of the LDV Cup on Saturday. The draw for round two of the competition will take place as per usual on the Sky's Soccer AM programme, with presenters Tim Lovejoy and Helena Chamberlain overseeing the proceedings. The draw usually takes place between 9:30am and 10:00am. The Shrewsbury Town Official website is reporting that ex-Hereford midfielder Ben Smith has been injuried in their LDV game against Bournmouth. Smith fell awkwardly in the first half and needed to be stretchered from the pitch, he was then taken to hospital and will be kept in over night. The early diagnosis is that he's dislocated his shoulder and this will need to be operated on. He has previously dislocated the same shoulder twice in his career. Jimmy Quinn was concerned after the game and Shrewsbury should have a better idea on the severity on the injury tomorrow: "The news on Ben doesn't look very good, he's being kept in overnight and the surgeon who operated on his shoulder last time he dislocated it will take a look at him. "It doesn't look good because if he has to have another operation then he could be missing for at least six-months. "He went down and landed on his elbow, then the lads fallen on top of him and put his shoulder out. "It's a big blow for us as Ben is a terrific player for us." Hereford United progressed to the second round of the LDV Vans Trophy northern section this evening following an entertaining encounter with Scunthorpe United. After extra times the sides were still level at 1-1 and a penaly shoot out was needed to decide a winner. Tony James, as expected, missed out and Tamika Mkandawire replaced him in the heart of the Hereford defence. Adam Stansfield was rewarded with a starting place as Lee Mills was left on the bench. Scunthorpe had the best of the opening period as they attacked in long spells. United's defence held strong though, and kept the Iron out. Cleveland Taylor hit a side-footed volley from outside of the box that forced Johnathan Gould into a diving save. Michael Rankine got a low shot in on goal after Tom Brighton had shot just wide from twenty-five yards. Tom Smith had Hereford's first effort following David Brown's cross, but he shot well over from inside the box. Craig Stanley smashed a thirty yard effort against a defender and Graham Hyde's follow up was tame. Hyde then set Stansfield away down the right wing and he played Danny Williams in on goal, but he was under pressure from defenders and the 'keeper, Tom Evans, managed to block his shot. Stanley broke the deadlock after thirty five minutes with a magnificent solo effort. The midfielder picked up the ball around the half-way line, ran at the defence and cracked a great effort from twenty five yards that left the 'keeper helpless as it flew into the top corner. Scunthorpe made one half time sub, Matthew Sparrow who had been booked was replaced by Wayne Graves. Rankine went close minutes into the second half as he span away from Mkandawire and shot a powerful low effort that went just wide. Hyde set Simon Travis away with a good pass down the right, but neither Danny Williams or Brown could get onto the end of his cross. Soon after, the Iron were back on level terms. A fifty eighth minute corner taken by Brighton was powefully headed in by Steve Torpey. Brown should have restored the lead minutes later though, Stansfield found him in space, but Brown managed to miss the target with his left foot. Stanley received an awesome pass from Smith in defence on the left wing and played a good pass into the path of Stansfield who found some space, but shot just over from the edge of the box. Brown again went close after a poor clearance by Cliff Byrne, but he lifted his shot inches over the bar. Mills and Danny Carey-Bertram were bought on for Stansfield and Brown in an attempt to liven up the Bulls attack. The sides were equal after ninety minutes, and so the game went into extra time. Goalscorer Torpey was replaced at the restart by Paul Hayes. Travis was called upon early in extra time, he had to clear a cross from Taylor off the line and Gould then made a good save from Graves with his legs. Brighton gave United a scare about half way through the first half, his twenty five yard shot deflected off a defender and clipped the top of the cross bar. Brighton then forced Gould into an easy save with a long range effort. Mills crossed for Hyde and he knocked the ball down for man of the match Stanley, who hammered the ball first time just over the bar just before half time in extra time. Brighton created the first chance of the final period, but his drive was just wide.Carey-Bertram sliced a shot wide after some neat passing by Hereford before Stanley had a curling effort saved by Evans. Travis collected a quickly taken free kick, played a one-two with Mills and then had his shot saved before Travis made a great run through the middle and played Mills in on goal but, similarly to Brown, he blazed over from a good position. Gould saved penalties from Rankine and Taylor after Williams had missed the Bulls first spot kick. Robinson, Smith and Travis then all put their shots away into the back of the net. Finally Carey-Bertram calmly tucked away the winning penalty into the bottom right corner to give United a 4-3 victory on penalties, and a place in the second round. HUFC Team: Gould, Travis, Mkandawire, Tretton, Smith, Robinson, Hyde, D Williams, Stanley, Brown, Stansfield. Subs: Scott, Gwynne, Mills, Carey-Bertram, A Williams. SUFC Team: Evans, Sparrow , Jackson, Stanton, Byrne, Featherstone, Taylor, Barwick, Brighton, Torpey, Rankine.Subs : Parton, Graves, Lillis, Williams, Hayes. Hereford had to play extra time against Scunthorpe this evening with the score 1-1 on 90 minutes. There were no more goals and the game went on to penalties which Hereford won 4-3. The attendance at Hereford this evening of 1414 was higher than near neighbours Shrewsbury and Cheltenham who also had LDV games. Hereford won through to the second round of the LDV Vans Trophy with a thrilling 4-3 penalty shoot-out win over League Two high-flyers Scunthorpe at Edgar Street. The first-round clash ended 1-1 after 90 minutes and following Craig Stanley's first-half opener for Graham Turner's Conference outfit and Steve Torpey's second-half equaliser there were no further goals in extra time. Both sides created chances galore in a classic end-to-end cup tie, but Hereford's Daniel Carey-Bertram fired home the winning spot-kick after Jonathan Gould had brilliantly saved from Scunthorpe's Cleveland Taylor. Stanley rocked Brian Laws' side just after half-an-hour when he found space enough to rifle home a right-foot shot from 20 yards. Visiting striker Michael Rankine fired in two long-range efforts after the restart before Scunthorpe levelled in the 58th minute. Tom Brighton swung in a corner and Iron fans favourite Torpey - in his first match of the season following a knee injury - rose to power home a header from close range. Another Conference game is to be shown on Sky TV. The Barnet versus Dagenham & Redbridge game will be shown live from Underhill on 9th October. The game will start at 12.30pm. Hereford United do not play on this day because its game at Accrington has been moved to the following Monday for showing on Sky. The Sky game has been hastily arranged possibly because Conference TV had announced it is to cover a game on that day. This edited article first appeared on the Official Scunthrope United site. Scunthorpe United manager Brian Laws will make wholesale changes to his side for tonight's LDV clash with Hereford United. Laws is expected to name a side with as few as two players who started Saturday's game starting at Hereford. The Iron welcome back Steve Torpey who has yet to kick a ball this season following knee surgery, the target man is likely to start the match alongside Michael Rankine in attack. Torps will be looking to prove his fitness as he hopes push for a place in the side for Saturday.s Lincolnshire derby against Boston United. Elsewhere goalkeeper Tom Evans, club captain Mark Jackson and defender Cliff Byrne are all likely to come in replacing Paul Musselwhite, Andy Crosby and Andy Butler. The Iron boss is also expected to utilise Cleveland Taylor and Tom Brighton who both came off the subs bench at the weekend. Despite the changes Laws insists he is keen for his side to progress in this competition but it won't be easy at Hereford. The Conference side currently sit second in the table after missing out on promotion in the play-offs last season. Hereford's home form has been indifferent with three victories and two defeats from their five matches. However they have recorded back-to-back home wins in their last two matches against Scarborough and Aldershot. Scunthorpe have not met Hereford since January 1997 when the Iron beat the Bulls 5-1 at Glanford Park. You have to go back as far as 1994 for the last Iron victory at Edgar Street when goals from Matt Carmichael and Ian Juryeff ensured a 2-1 victory. Of the 40 meetings between the two sides the Iron have won 18 and Hereford 12. Meanwhile the Official Hereford United site carries the excellent news that youngster Sam Gwynne has been given the No 21 shirt. There is currently a vacancy for an editor of a Hereford United website and it's paid. No it's neither Bulls News nor the Official site but Footy Mad who are looking for someone to become editor of their Hereford United footy-mad site. Currently Footymad have around 100 editors for their 156 sites. Most of the missing 56 are the old Div 3, Conference and Scottish 2 and 3. Editors need to keep the sites up to date (around 20-30 new items need adding a month), keep an eye on the messageboard (banning those that abuse it) and find ways of attracting more people to the site. Editors have a lot of control. Renumeration is based on regular updates being done, a discretionary £25 a quarter plus payment based on site traffic. It is more a labour of love than a way of making money. Hosting is paid for by Footymad. They update the squad, send automated previews, teams before games and match reports. You can also find a sponsor for the messageboard (until 31/7/05) and keep any money they will pay. But you must get approval for the sponsor from footymad. Hereford United will play hosts to Scunthorpe United in the LDV Vans Trophy Northern Section tomorrow evening. Hereford are unusually placed in the northern section of the competiton because the twelve conference clubs have been split into six for each section. Hereford are one of the six more northern teams, thus are in the northern section. Scunthorpe are currently second in League Two, just a point away from leaders Yeovil Town. They have no fresh injury worries for the tie, but Steve Torpey has recovered from injury and may feature in the Iron attack. Tony James is a doubt for Graham Turner's men. He has picked up a thigh strain and is likely to miss out. Tamika Mkandawire should deputise. Jamie Pitman is expected to miss out again with a back injury as will Rob Purdie and Ryan Green, the two long term absentees. The Bulls may field some fringe players as the first team regulars may be getting tired with the current busy schedule. Lee Mills might be rested and Adam Stansfield could get a start after his impressive performance on Saturday. Danny Carey-Bertram may also look to get some first team action. "Scunthorpe are going well in their division and are yet to lose away from home so we know what we are up against. They will be stiff opposition for us. We will be taking this game very seriously and it's a great opportunity, especially for some of our younger players with ambitions to play on a bigger stage, to show they can compete on a higher level." Said Graham Turner, speaking to the Evening News. "I may have to make a change. Tony James is looking doubtful with his thigh and I think the best thing might be to rest him as precaution." It will be interesting to see if Hereford treat the game simply as a match to allow the fringe players some match pratice, or if they field a strong side in hope of having a good run in the competition. Tony James, the Hereford United captain, may be a doubt for tomorrow's LDV game. The BBC is reporting that he has picked up a thigh strain. At Preston North End it has been confirmed that Billy Davies has been appointed manager. He has been care-taker manager at the club since Craig Brown left, and this appointment could mean that discussions about Johnathan Gould's contract will move forward. Meanwhile, the Hereford United youth team draw 1-1 with Northampton last Saturday. The Exeter manager is leaving the club for a post at Reading. Eamonn Dolan started his coaching career with Exeter where he was appointed manager in the summer of 2003 and led the Grecians to sixth place in the Conference last season. Dolan said: "I was really happy at Exeter and had previously turned down several other offers." He is to become the academy director at Reading. Meanwhile Northwich Victoria have confirmed that a consortium led by Mike Connett has entered into a contract with administrators Begbies Traynor to buy the club. "We're confident that everything will be rubber stamped very quickly," said Mike Connett. "The new consortium has exciting plans for the future of Northwich Vics. We have assembled a new board, which includes Rod Stitch, who is well known in the Northwich area. The new board will provide financial stability for the club. "We are also confident that the new Victoria Stadium at Wincham will be completed this season," he added. Hopefully this news will stop the Conference applying a ten point deduction to the club. Finally, Leigh RMI are unable to say how many Hereford United supporters went to the game on Saturday as all fans use the same gate. However an official told Bulls News after the match that there were more away supporters than home fans. Hereford United take a break from Conference duties tomorrow evening when they entertain Scunthorpe United in the LDV Vans Trophy first round. The Bulls have been placed in the northern section of the competition for the first time. This is because of how those clubs from the Conference that are competing in the this cup are splilt. More "southern" clubs have been invited to take part. Scunthorpe are joint second in the Coca-Cola Division Two. They were held at home, 1-1, by Mansfield last Saturday. However they are unbeaten away in their league to date with two wins and three draws. Admission prices for the match are the same as for a Conference game. Season Ticket holders also have to pay for this game. Conference TV is to show its second free game in two weeks time. They have chosen to transmit the Scarborough versus Aldershot game on Saturday October 9th. Wales play England on that date and Hereford United are without a game as their away match against Accrington Stanley has been moved to the following Monday and will be shown on Sky. Conference TV says that their problems have been rectified and that BT have upgraded their system. It is beleived that the game will start at 1pm but Conference TV have not confirmed the start time. There were reports of trouble after two Conference games yesterday.Carlisle fans reported problems at Aldershot and Tamworth fans similar from Exeter. It appears that police at Aldershot were unable to control local thugs who tried to storm a Carlisle supporters coach, not unlike the scenes Hereford fans had to endure last season when trying to leave the Rec. There was also a report that some Carlisle fans were attacked at Aldershot railway station. After the Exeter game, where Tamworth were the visitors, there were more reports of trouble. The Tamworth coach was targeted by so-called Exeter fans and another small group of Tamworth supporters, last to leave the ground after taking their flags down, say they were approached by a group of trouble-makers as they left the ground. Both Aldershot and Exeter usually have plenty of Police on duty outside the ground. There were no police visible at Leigh yesterday for the visit of Hereford and no reports of trouble. Neither was there any segreation of supporters. 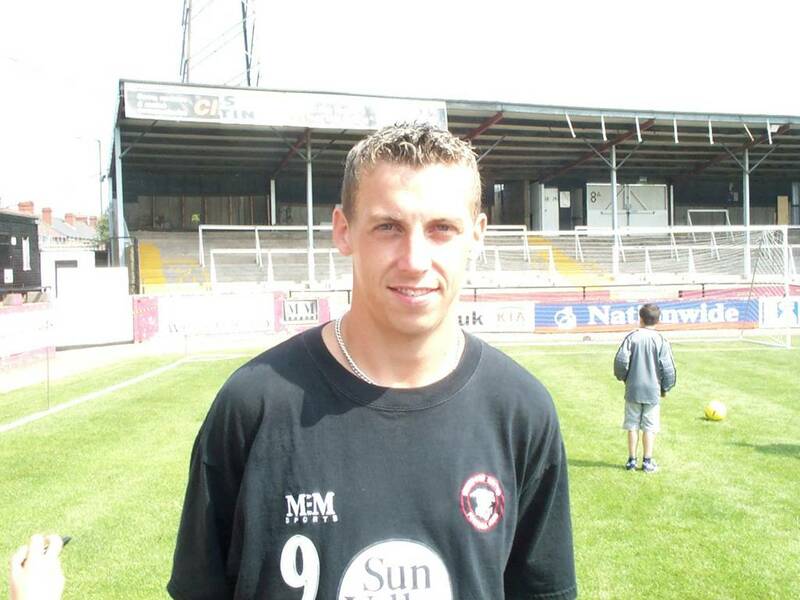 With two goals yesterday, Adam Stansfield (pictured), the Hereford United striker, took his tally for the season to six. Both he and David Brown are at 10-1 with SkyBet for the leading Conference scorer. Lee Mills, who with Brown is on four goals, is now quoted at 40-1 by the same company. Mills also scored twice yesterday. However his odds have dropped from 66-1 early last week. The Barnet striker, Giuliano Grazoli, heads the list with nine goals. Hereford United were very lucky to come away from Hilton Park with all three points this afternoon following a thrilling end to the game. Leigh will feel they should have collected at least a point from the match, especially when they equalised for the third time in the eighty nineth minute but Adam Stansfield found the bottom corner to give United the win in added time. The Bulls must have thought that the game would be a walk in the park when they took the lead in the seventh minute, but Leigh didn't let their heads dropped and battled on. Simon Travis collected the ball after Lee Mills had a shot blocked, and crossed for Mills who headed into the top corner at the far post. It was easy to notice that Hereford took their foot of the gas soon after and Leigh took full advantage of it. Hereford started playing some sloppy football and didn't seem able to get any passing moves together. Alex Meechan first threatened for Leigh, but his shot was just too high. Danny Williams and Mills both went close with long shots but Leigh should have equalised with their next attack. Graham Hyde, deputising for the injured Jamie Pitman, was dispossesed deep in his own half and the cross was headed down by an unmarked Karl Rose at the far post, but Johnathan Gould excelled and tipped the ball wide. Andy Tretton had to concede a corner to deny Rose, but the corner resulted in a good United attack. Travis collected the loose ball and sprinted the length of the pitch and won a corner. Meechan made another chance after poor defending by Mark Robinson, but again he shot over from twenty yards. Mills came closest to doubling Hereford's lead on the stroke of half time, but he lifted Robinson's cross just over the bar. Leigh were looking even more dangerous as they started the second half and Rose's header that looped just over was a warning for Hereford. Ex-United right back Chris Lane crossed in for Rose, who headed the ball down in the box for Warren Peyton to tuck in the equaliser. It was what Leigh deserved. United reacted to the goal and went straight on the attack. Mills went close with a header once again before he grabbed his second of the game. David Brown skipped a challenge in the midfield and then set his strike partner through on goal and Mills made no mistake when one on one with Ian Martin from the right of the box, slotting the ball into the far bottom corner. However, Leigh hit back and within two minutes a second corner in quick succession was superbly headed home by former Hereford man Gareth Stoker. Tretton denied Meechan by deflecting his shot over as Leigh continued to take the game to Hereford. Rose forced a save out of Gould before they Railwaymen thought they'd taken the lead. Meechan latched onto a ball over the top of the defence and calmly placed the ball in the back of the net, but the assistant referee had already raised his flag for offside. Graham Turner made his first change of the game after sixty seven minute. Williams was replaced by Adam Stansfield and Brown dropped back into the midfield as United looked for more options in the attack. Gould was lucky only to be booked when he gathered a loose ball just outside of the box. Brown linked up with sub Stansfield who used his pace well to win a corner but Mills headed the cross from Robinson over. Craig Stanley played an awesome through ball to Stansfield who should have netted, but instead his tame effort was easily gathered. The Bulls won a corner in the eigthy second minute which Robinson swung in. Man of the match Stanley hit a volley that was blocked, but it fell kindly to Stansfield who turned it into the back of the net for 3-2. Still, Leigh wouldn't give in and they tested Gould with a twenty five yard volley from substitute Steve Smith. Smith got a second chance a few minutes after from a similar range and this time made no mistake. A corner was only half cleared and Smith hit a low drive that travelled through a crowd of players and caught Gould unaware as it flew past him. The home supporters must have though they had surely gained a well earned point now. In injury time Stanley lifted a pass through to Stansfield who was too quick for the defence and he tucked the ball into the far bottom corner to the delight of the 300 or so away fans in a crowd of 585. Graham Turner is going to have a difficult task in deciding whether to start Stansfield for the next game, he has netted six times this season. Leigh had yet another chance to equal in the last minute of injury time when they won a corner. Brown was replaced by Tamika Mkandawire to help defend the corner which United did successfully. Hereford will not be happy with their performance; it was woeful to say the least. Jamie Pitman was missed in the midfield and, if he is injured for too long, it won't be a surprise if Turner makes new additions to the squad. United will be thankful that luck was on their side this afternoon, and Leigh will wonder how they failed to take anything from the game. HUFC Team: Gould, Travis, James, Tretton, Smith, Robinson, Stanley, Hyde, Williams, Brown, Mills. Subs: Mkandawire, Scott, Gwynne, Stansfield, Carey-Bertram. LRMIFC Team: Martin, Lane, Stoker, Miller, Gaunt, Meechan, Peyton, Byrne, Fitzpatrick, Roscoe, Rose. Subs: McGuire, Smith, Mitchell, Simms, Morton. Hereford United's 4-3 win at Leigh was rather lucky for the Bulls with the winner coming in added time. After the game Lee Mills, interviewed by Terry Goodwin for BBC H&W, thought it must have been fantastic entertainment for the fans but not for the Hereford team. "It was a little nerve racking for the boys who were playing," he commented. "The first goal was a far post header which is my trademark and the second was a side foot (after a pass) from David Brown who has done ever so well for me." Mills laid on two goals for Adam Stansfield, who came on as a sub. "Adam has been unfortunate as he has been out of the side for the last three games but he's come on today and done a job. "Leigh gave us a good game this afternoon. First half we had the wind and went 1-0 up but second half was a lottery as to who was going to win. "The boys weren't too pleased with our performance but it's three points." One Leigh supporter in particular wasn't very pleased when Stansfield scored the winner. He had placed £5 on a 3-3 draw with odds of 66-1, which would have netted him £330. Not his day. Graham Turner is still on the look-out for players to strengthen his squad. The Hereford United manager told BBC Hereford and Worcester that he is looking to make an addition or two to the squad in the next month or so. In the interview, which will be broadcast this afternoon, he suggests that extra cover could be needed in several areas. Meanwhile it is still not clear whether a deal has been done with Preston North End to allow Johnathan Gould to stay at Edgar Street, although his name is not now on the PNE squad list. The list mentions several players who are on loan to other clubs but nothing about Gould. The goalkeeper can stay at Edgar Street until October 11th under the present deal. His contract at Preston is until the end of the season, so either his contract has to be terminated to the satisfaction of both parties, which would make him a free to move, or a deal could be done to extend the loan to Hereford United for either another month, or the rest of the season. There will be no replays in the Conference Cup. All games will have to be decided on the night. The rules were announced today by the Conference. The main details are printed below. 1. All matches to be played on a single leg basis. Should a match end in a draw after 90 minutes two equal halves of 15 minutes extra time will be played, should the scores remain level at the conclusion of extra time a tie will be decided by Kicks from the Penalty mark in accordance with International Board Decisions. 2. Nationwide North and Nationwide South Member Clubs will enter the competition at the Preliminary Round stage. 3. Nationwide Conference Member Clubs will enter the competition at the Third Round stage. 4. All rounds drawn on a regional basis of Conference North and Conference South and regionalised up to and including the Semi-Finals. 5. All ties will be played on a cup tie basis for financial distribution. Match Day income from the attendance following all match expenses will be shared on a 50% basis by the two clubs. Should a match incur a loss the two clubs will share such loss on an equal basis. Whether the main Conference clubs want this cup is debatable. It could mean more congestion at the end of the season, which finishes earlier this year anyway. And if attendances are low, clubs will have to stand the loss. Hereford United enter in round three which is to be played in the last week of January. Round four takes place in the week starting on February 14th. If the Hereford defeat Burton, then the Bulls will play the winners of the round three game between Northwich and Leigh at Edgar Street. If successful the Bulls will have an away game in round five. Although Leigh RMI are still part-time, Graham Turner doesn't think that will affect the outcome of tomorrow's game. The Hereford United manager thinks that they will hope to upset the Bulls. "They will be ready to upset us and get a result." he told BBC Hereford and Worcester. "We have got to be ready for that." "The vast majority of sides in the Conference are well organised, well coached whether they are part or full-time. Most have a bit of purpose about their play and I don't expect Leigh to be any different from other Conference sides." Meanwhile Graham Turner has praised Danny Williams for his efforts so far this season. "Danny has been excellent of late and has really been influencing games for us. Scarborough put a man-marker on him, that's how much respect teams have for him," Turner told the Evening News. "I think he's a very clever player and has got a very good perception of the game. He's in such an important position but he combines well with the other players." Hereford United have been drawn away to Burton Albion in the third round of the Conference Cup. The game will take place in the week commencing January 24th, probably on the Tuesday evening. The tie comes a few days before the visit of Hereford to Aldershot, which will be a much more important game as both clubs are likely to be pushing for a play-off place of even top spot in the Conference. However there is a possibility that the Aldershot game could be postponed because it is the FA Cup fourth round on that day. Hereford join the Conference competition in the third round. Hereford United travel to Hilton Park, home of Leigh RMI, tommorow afternoon, kick off 3 p.m. The Bulls have a good record there, winning all four of their last visits including a 5-0 drubbing at the end of last season. Other teams at the top of the Conference have difficult fixtures so if results went Hereford's way they could find themselves on level points with Barnet at the top. Leigh hope to have ex-Shrewsbury Town centre back Gregor Rioch back in contention following a knee ligament injury that has kept him out of action for a month. He has only played twice for RMI since his move from Northwich. "He's doing all the training now and hopefully he can get a reserve game and train again to be contention for the weekend," said Phil Starbuck. Martin Moran has mumps, Gary Williams is suffering with a thigh strain and Gareth Holmes has a cartilage problem so all three may miss out. United have a few injury problems, tenacious midfielder Jamie Pitman has a back problem from Tuesday's game so Graham Hyde is set to deputise. Rob Purdie and Ryan Green are long term casualties but Tamika Mkandawire and Danny Carey-Bertram have both returned to full fitness. Neither team have any suspensions for the game. Hereford have now hit a bit of form with three straight wins, but Graham Turner has warned his players not to get complacent. "If we focus, if we pay as much attention to the build up as we did against Aldershot and if the players have got the single mind about them that we need those three points, then we will come away with the three points," he said on BBC H&W. "If there is any feeling that we have done the hard part in beating Aldershot, nine points out of nine, a great return and there's suddenly a relax in attitudes then we could come un-stuck." The Railwaymen, currently twentieth in the league, haven't had the best of starts gaining six points from their first nine games. However, they have proved that they aren't always a walk over as Aldershot found out when they visited Hilton Park. The Shots had to score in the ninetieth minute and again in added time to claim a 3-3 draw with Leigh. Carlisle United Football Club has lost £1.15 million in the year to June 30th 2003 according to the Carlisle News and Star. And it is still losing money despite cutting costs. The club is said to be £2 million in debt, but new chairman, Fred Story, claims the club is trying to balance the books. However Story admits that the latest accounts due to be published by the end of November will show heavy losses. Story said: "We have reduced the wage bill by £350,000 a year and reduced interest payments by £130,000 a year by consolidating the club's debts." The 2003 accounts should have been filed by April 30 but were only received at Companies House in Cardiff this week, a delay that cost United a £1,000 penalty. Wage costs, during the period, increased by 45 per cent to £1.59 million and other debts included £465,000 to trade creditors and £498,000 owed to the tax man. Graham Turner has paid his own tribute to Brian Clough in today's Hereford Times. When Turner was manager at both Aston Villa and Wolves he came into contact with the legend. "He was fascinating to listen to and convinced in his views on how the game should be run. "There was a time when he was well known for kissing everybody and I once had one of those famous kisses. "But it's a sad loss and he will always be remembered for the quality of the football his sides played." Meanwhile, the Welsh squad for both the England and Poland games has been announced and Paul Parry has once again made the squad. There has been quite a lot written about the televising of Tuesday evening's game by Conference TV from Edgar Street. Like many new ventures not all went strictly to plan and many viewers were left disappointed with the broadcast. It appears that BT underestimated the demand and has promised to do better next time. UPDATED 6pm: Since the broadcast it was suggested that Conference TV were considering taking action against Confguide over remarks made on that site and partly repeated on Bulls News. We have been informed in the last hour that no action will be taken against Confguide. Conference TV was set up by In The Box Media who bought the exclusive broadband rights to show 300 Conference games in April this year. ITBM has enormous experience within the field of broadband especially in the US. They are now working with The Football Conference Limited (the governing body for Nationwide Nation, North and South), British Telecom and Sporting Life to bring a similar level of exposure to the UK. The Conference are said to want the publicity and are keen to bring in extra revenue. The idea is to work with the clubs and the fans. On 29th July this year UK Betting Limited acquired ITBM for around £1 Million. UK Betting controls several well known companies including Sporting Life and Rivals.Net. So it looks as though Conference TV will not fail for lack of funding. The rights are for 20 "live" matches per season, plus 300 highlighted games across the 3 year deal. Clubs have to allow filming at their ground as part of the deal with Conference TV, but the company is convinced that clubs will benefit. Graham Turner, the Hereford United manager, is yet to be convinced of the benefits of Conference TV. On the one hand attendances may be affected especially when live matches are transmitted, on the other hand Conference TV say that increased publicity about the Conference will bring its own rewards to the clubs. At present if Sky broadcast a game then there is a fixed fee. It is unknown how much Conference TV will pay to the clubs. But Conference TV insist that there will be an injection of money that will benefit all clubs. They have made the point that Graham Turner may not have been fully briefed on any payments. Conference TV had problems last Tuesday for which they blame BT as it failed to realise how high the demand would be. No doubt these problems will be sorted and next time a game is live on Conference TV it will again be free to viewers. Charges for live games are coming however. It is understood that the cost will be about £2 per game. However until Conference TV reveal how the deal will benefit clubs, there are bound to be questions. Ryan Green, the Hereford United winger, is due to see a specialist today about the injury problem that have kept him out of the team for most of the season. It is said that he has abdominal problems, although there have been suggestions that he may need a hernia operation. Jamie Pitman is thought to be a doubt for the Leigh RMI away game on Saturday after coming off with a back injury on Tuesday evening. Rob Purdie will once again miss the match as well. Meanwhile two ex Bulls stars will meet up in the next round of the Carling Cup. Richard O'Kelly's Bournmouth, who defeated Blackburn last night on penalties are drawn at home to Paul Parry's Cardiff City. Graham Turner told the Evening News that he was happy with last night's defeat of Aldershot. "Aldershot have some very good players going forward so we had to be a little bit cautious," Turner said. "But I still think we created the better chances. "There were two sides out there who want to play football in the right manner and I think we've done ever so well to keep a clean sheet. It's a big scalp for us." Meanwhile it has been revealed that the Conference TV coverage of the game was not a total success. Graham Turner didn't seem too keen for it to be even used at Edgar Street. "I'm not certain what the benfits are to this club of the live screening, we haven't been informed of any financial benefits," he wrote in Bullseye. Conference TV issued a statement saying :We apologise for those who tried to connect - Over 4,500 users tried to access the live game & we were unfortunately unable to meet demand. Confguide have slated the coverage. They suggest that the Conference should " Hire someone who knows what they're doing, or forget it. The current amateurish setup is an embarrassment." Hereford United defeated Aldershot 2-0 at Edgar Street tonight. Jamie Pitman (pictured) had to leave the pitch half-way through the first half after Aaron McLean appeared to crash onto him. Pitman looked as though he had hurt his back and was in some distress. Perhaps surprisingly the referee took no action against the Aldershot player but the incident didn't go down well with the Hereford fans who had been calling McLean a cheat from the kick-off. After the game Tony James told BBC Hereford and Worcester that it was a very good performance by the Bulls. "I thought we had a great quarter of an hour spell at the start which set us up for the rest of the game. "The early goal (scored by Danny Williams) helped. A great confidence booster. David Brown, who otherwise had a good game,later missed a sitter from three or so yards. "It was a good chance. A good ball in but it is a bit bobbly there. He put it over the bar which was a bit of a shame. But we went in at half-time 1-0 up and were quite pleased with that," said James. "Aldershot had a lot of the ball (after the break). I think we sat off a bit, kept our shape and tried to make it as difficult as possible for them to get in behind us. And we always looked dangerous on the break." Describing the secong goal James continued:"It was a good header. Could have done with it a bit earlier in the game as we were under a bit of pressure. Cracking header from Lee Mills. "The win was just what we needed." Hereford United beat Aldershot Town 2-0 this evening at Edgar Street and have now won back to back home games for the first time this season. It is their second home victory in four days and the Bulls will be delighted to have gained some sort of revenge on the side that knocked them out of last seasons play offs. Graham Turner named an unchanged starting side, but Tamika Mkandawire replaced Andrew Williams on the subs bench. This meant that Lee Mills started his second game in a row and Adam Stansfield was again named on the bench. United couldn't have wished for a better start and found themselves in front after four minutes. The first chance of the game fell to Danny Williams who found the bottom corner after receiving a pass from Jamie Pitman on the edge of the box. Hereford, who dominated the first half in most parts, almost doubled their lead when Mills went close with an overhead kick following a well worked free kick when Tony James picked out Andy Tretton with a long pass. Adam Miller forced Johnathan Gould into a save, but the 'keeper had no problems with the twenty-five yard effort. David Brown had the best, and easiest, chance of the game midway through the half. Williams found Mills in the area who crossed for Brown, but somehow he managed to shoot over from two yards out. Aldershot then had their best period of the half when they won two corners in quick succession, although both were dealt with by Tretton and Tom Smith respectivly. Tim Sills almost equalised for the Shots soon after. Aaron McLean flicked on a long ball but Sills narrowly missed the target with a powerful shot. Jamie Pitman had to be replaced after picking up a knock in a challenge involving McLean. Graham Hyde, who had what was probably his best game in a United shirt, was subbed on. The Shots started the second half with McClean getting in two crosses from the right, but neither troubled the United defence. Tretton made a crucial intervention denying Sills from getting in on goal as Aldershot put lots of pressure on the Bulls. The Shots, urged on by their 251 supporters, saw plenty of possesion but rarely threatened Gould's goal. Hereford's best form of attack was on the break and they had several counter attacks in the second half. Craig Stanley made a long run from defence and forced a corner which was headed over by Mills. Hyde found Brown in lots of space on the left and the attacker moved in on goal but had his low drive saved when it looked easier to score. Terry Brown made all three substitutions within a short space of time to try and put more pressure on Hereford. Roscoe D'Sane replaced Nick Critteden, Will Antwi was subbed on for Ray Warburton and Matthew Barnes-Homer replaced Phil Warner as the Shots looked for more attacking options. Sills went close with a header from a corner just after D'Sane shot wide from close range. Simon Travis made a break down the right and won a corner at the end of it, in the eighty nineth minute. After McAuley had received treatment having collided with Travis after the Hereford man had played the ball, man of the match Williams was allowed to swing in the corner that Mills met at the far post and headed down into the bottom corner to wrap up the victory. Back to back home victories will delight Graham Turner and the majority of the crowd of 3,647, the highest at Edgar Street this season. The Bulls performed solidly and have now moved up to third in the league, level with Aldershot. United have now won three in a row and will be hoping to continue this good form with a victory at Hilton Road next Saturday, where Leigh RMI are the oppenents. ATFC Team: Bull, Warner, Bernard, Giles, Warburton, Miller, Chalinor, Critteden, McAuley, Sills, McLean. Subs: Barnes-Homer, Smith, Johnson, Antwi, D'Sane. "We will have to work hard and grind out the result," Terry Brown has told the Aldershot News and Mail in a preview of tonight's game at Edgar Street. "It is important that we do that, because I certainly don't want to go there and get beaten. "Hereford will always hold a special place in my heart as that was a never to be forgotten day. But this is a totally new season, and they will be wound up so much for it. I would think that in the Hereford supporters' calendar, this is a must, must win for them. Still, it is a must not lose for us! "I wrote in my programme notes today that after ten games, we will know a lot more about our state of play. By that, I mean after we have played the likes of Hereford and Carlisle. I will know a lot more then as to who is going to make a concerted effort for the league. It's still early doors, but if you look at league tables, they don't often lie after ten games." A hot reception, as well as a big crowd is expected to greet the Shots tonight, with striker Aaron McLean possibly the target for the boo boys after being involved in the critical sending off of Hereford's Andy Tretton in the play-off semi-final second leg. McLean was branded a cheat by the home support after the defender had pulled him back, although Brown believes his front-man will always cause defences problems, saying: "Aaron is always a handful. His energy levels cause no end of trouble for defenders and lets not forget what a superb game he had over at Hereford on that day." Though Brown has slight worries with McLean (swollen ankle) and Darren Barnard (stitched mouth) the boss is unlikely to leave them out for the trip tonight. Graham Turner has told the Evening News that he thinks Aldershot will come to Edgar Street tonight and play an attacking game. "Aldershot have some very good players and they are naturally an attacking team. Unlike most sides, I expect them to come here and have a go at us." Looking back to Saturday's game with Scarborough, Turner praised goalkeeper Gould. "It was pleasing to pick up three points but I don't think we played particularly well. "Jonathan pulled off a couple of excellent saves in both halves to keep us in it. He has done extremely well for us. "That was David's fourth goal of the season and it was important because we did not create a lot of chances. "Lee did well in his first start for us. He's got a lot of energy and is good in the air. He can get a lot fitter and then we'll probably see the best of him." This article is from the Official Aldershot Town Website. After last season's perceived failure, Hereford have embarked upon something of a re-building programme with a younger squad, but still find themselves under the same pressures and amongst the favourites for promotion. Most notable of all the departures have been 3 of the biggest factors in their success: goalkeeper Matt Baker to Wrexham, top scorer Steve Guinan to Cheltenham and defender Michael Rose to Yeovil. However, Graham Turner has brought in Jonathan Gould on loan from Preston to ably replace Baker, and his performances have been vital, especially against Northwich and in Saturday's hard-fought win against Scarborough, as Hereford have struggled to find their best form. Similar to last year, their home form hasn't been the best, and indeed their two defeats so far this season have been at Edgar Street. Manager Graham Turner has been worried about several individual errors that have cost the team, and while they continue to look impressive going forward, questions have been asked of the defence. Hereford have dominated most of their matches so far this season, but have at times failed to capitalise on their territorial advantages. They couldn't deal with Stevenage's physical long-ball game, and would have been punished had Scarborough taken their chances. Most visitors have tried to stifle The Bulls natural attacking instincts, but in their shock 3-1 victory, Halifax played three strikers and so surprised were Hereford that they didn't change formation until the game was lost. Adam Stansfield, signed from Yeovil, is being hailed as Steve Guinan's most likely successor, and has already forged an impressive partnership with the ever-dangerous David Brown. Ryan Green and Simon Travis continue to provide excellent service from the wings, and are already a plentiful source of goals. Lee Mills and Craig Stanley, signed after Telford's sad demise, have also forced their way into the reckoning with some impressive performances. Green, however, is struggling with an abdominal injury that could require a hernia operation, and along with Tamika Mkandawire (arrived from West Bromwich Albion) and Rob Purdie, missed last Saturday's win. Hereford at Edgar Street will never be an easy challenge, but maybe this is the best time to face that challenge, as the team continues to find its feet and fall victim to unforced errors. Ultimately, though, Aldershot would probably be satisfied with a point. Hereford United face Aldershot Town this evening at Edgar Street. This should be the best attended home match so far and there is every reason to expect that the atmosphere should also be the best this season to date. Aldershot are in fine form at home, they haven't dropped a point, but their away form is two wins out of four with one draw and one defeat. Crawley defeated them 1-0, at Leigh they draw 3-3, but they defeated both Stevenage and Woking by 1-0 and 2-1 respectively. None of the teams that the Shots have played away are above Hereford in the Conference table. Bulls supporters will also note that Hereford were unlucky to conceed a last minute goal at Crawley in the 1-1 draw. However Hereford's home form isn't as good as it should be considering their away form. Two wins and two defeats isn't the best of starts to a season when the Bulls are expected to be at least in a the play-off place at the end of April. The defeat by Stevenage was perhaps harsh on the day but the defeat by Halifax a fortnight ago was deserved. The defence was at sixs and sevens and let in three sloppy goals. However the introduction of Tom Smith to the team in place of Tamika Mkandawire appears to have steadied the ship. The back three looked more comfortable both at Gravesend, especially in the second half, and last Saturday against Scarborough. In midfield there have been calls for Graham Hyde to start leaving Jamie Pitman on the bench. Hyde has not featured other than as a substitute to date at Edgar Street. On the one hand some think Pitman has not "challenged as well" as in previous seasons, but on the other hand others are of the view that Hyde adds little to the side when he comes on. Unless Pitman is still not fully recovered from summer surgery, Graham Turner may well stick with him. Robinson is expected to take Green's place on the left once again allowing Travis to play on the right where he seems happier. Travis had an excellent game again last Saturday and had it not been for Johnathan Gould's performance in goal, could well have been Man of the Match. Craig Stanley is, once again, expected to partner Pitman in midfield. But there could be a surprise upfront where Rob Purdie will still be missing. Last Saturday, Lee Mills played his first full 90 minutes for the Bulls. Adam Stansfield was left on the bench but came on late in the game to replace David Brown, who scored an excellent winning goal. Mills could start again as his ability to win balls in the air could be very important this evening. He may partner Stansfield with Brown tucked in behind them. However this arrangement could leave Danny Williams on the bench. Williams has had an excellent start to the campaign and would feel hard done by to be left out. Unless he is chosen ahead of Pitman. Should Graham Turner go along with these thoughts the starting line-up will be: Gould, Smith, James, Tretton, Robinson, Pitman, Stanley, Travis, Brown, Stansfield and Mills. On the bench would be Williams D, Scott, Hyde, Carey-Bertram, and Mkandawire. Whoever Turner selects, the squad knows that if they play to their ability, Hereford United can pick up three points from this game. Meanwhile as a large crowd is expected the advice has to be to reach Edgar Street in good time and try to have the correct money for tickets at the turnstiles. This will speed up the time taken to get into the ground. This is an important match for the Bulls. It is to be hoped that as many supporters as possible that can get to the ground will make the effort. With a dry, but breezy, evening forecast there's little excuse not to be there. If you really can't get to Edgar Street to see tomorrow's match between Hereford United and Aldershot Town and you have access to Broadband TV, then the game will be shown live on the Football Conference's official broadband website www.conferencefootball.tv. The game kicks-off at 7:45pm, and for anyone who can't make it to the match, simply log on to www.conferencefootball.tv, and watch it from the comfort of your own PC. Aldershot Town are also showing the match live in the social club via footballconference.tv for any supporters unable to make the trip to Edgar Street. The social club will be open to members and non members from 6.30pm and admission will be £1. Fans will also be able to register for further games, which will be shown throughout the season on a pay-per-view basis, with the schedule yet to be confirmed. Hereford United play hosts to Aldershot Town tommorow evening for the first time since the play offs last season. Hereford have won their last two games and will be looking to start a good run of form, but Aldershot will be full of confidence following a 4-0 victory over Dagenham & Redbridge. Many of the Hereford supporters will see this game as a revenge match, but the players and staff at Edgar Street are looking at the game like any other one. The Shots, who currently have three more points than United, should have Nikki Bull in goal, although he is suffering from a fractured finger. Steve Watson will definatly miss out through suspension. Hereford United will have Tamika Mkandawire back in contention for a place in the squad, although it is expected that Tom Smith will be preferred in the starting eleven. Ryan Green will miss out again with an abdominal injury and Rob Purdie is still sidelined. It is expected that Graham Turner will stick with a winning side for the visit of Aldershot, meaning that Lee Mills will be selected in front of Adam Stansfield. Speaking to the HUFC official website about Tuesday's game John Trewick, the Hereford United coach who is sponsored by Bulls News, said, "We know it will be a very tough one on Tuesday and they'll certainly come here full of confidence after a fine win over Dagenham on Saturday." "However, we're in good heart too after back-to-back wins so it has all the makings of being a really good game. You would expect them to come here trying to win the game and that should suit us a little more if they come out and play. That gives us the chance to express ourselves in the way that we want too, and I know the players are looking forward to the game". David Brown has also spoken of his hopes for the Aldershot game. "I think we're capable of beating any team in this league if we play to what we are capable of. Aldershot will fancy coming here and getting three points and that will make it an attractive game. "I don't think we're looking at revenge. We have just got to get on with every game." Aldershot failed to defeat Hereford in any of the four meetings last season, the Bulls were victorious in both of the league fixtures. The game is sure to be full of incident and excitement,especially if it is like the corresponding fixture last season. A large attendance is expected and if the home fans get behind the Bulls then they could act as a "twelth man" and help United to victory. Hereford United will welcome Aldershot to Edgar Street tomorrow evening for what potentially promises to be the game of the season so far. Last Saturday, Aldershot defeated Dagenham and Redbridge 4-0. However the only person booked for the Shots was Aaron McLean, who just happened to be the player involved when Andy Tretton was harshly sent off last season against Aldershot in the first game of the play-offs. The following description of events from Saturday comes from the Official Aldershot Town website. With the game all but over and half time approaching fast, McLean was pulled back in the box by Goodwin and referee Mr Phillips pointed to the spot. But Tim Sills sent his penalty kick wide and with it the chance to make it four. With half time only seconds away, McLean caught Ashley Vickers with a late tackle that earned him a yellow card, but the tall Daggers defender had raised his hands to push McLean in the face in the resulting discussions and was sent off for violent conduct. Bulls fans are bound to watch McLean carefully tomorrow and let the referee know if they feel he may have breached the rules. Aldershot have already received 14 yellow and one red card this season. Hereford United have received just two yellow cards. Most bookmakers currently seem to have Hereford United at between 4-1 and 5-1 to win the Conference, but SkyBet have reduced the Bulls odds to 7-2, in front of the rest of the teams. As regards the remainder SkyBet have both Aldershot and Carlisle available at 9-2 with Accrington at 5-1. Suprisingly Barnet, who top the Conference, are at 11-2. The remainder are from 16-1 upwards. Both David Brown (pictured) and Adam Stansfield are at 10-1 to become top scorer with Lee Mills at 66-1. As regards Tuesday's game with Aldershot, Skybet have Hereford to win at 4/5, a draw at 12/5 and a win for the Shots at 11/4. It was a mighty struggle. "It was a mighty struggle but the result is the important thing," Graham Turner told the NLP after yesterday's game. "Scarborough are not a bad side and, particularly in the first half, we were at full stretch to contain them. "Again at home we've not really got it flowing but we've ground out a result. That is sometimes important and should give us a little bit of confidence going into the Aldershot match on Tuesday. "But we've got to thank some excellent saves from Jonathan Gould for getting the three points. "We've not found our form at home yet, there's no doubt about that, but it was an excellent goal to win the game, a good cross and a good finish." Nicki Henry, the Scarborough manager, also praised Gould for his excellent work in goal. There needs to a lot more support at Edgar Street for Hereford United next Tuesday evening if the attendance is to get close to last years gate of 4985 for the equivalent fixture which took place on August Bank Holiday Monday. With Aldershot charging just £1 to watch the game on Conference TV, it is thought highly unlikely that they will bring anywhere near the 440 fans that made the trip to Hereford last season. Even if Aldershot bring half last years numbers, the Bulls will lose about £1,700 in comparison. It is understood that the club doesn't receive a fee for the live showing of the game. To date the average gate at Edgar Street this season is 3289. Yesterday's fixture with Scarborough failed to reach 3000, whereas last season 4980 saw the game which took place one week earlier. The receipts from the turnstiles would have been around £15,000 less just for that one game. If this trend continues, Hereford United will soon be back to no more than a break-even situation. After coming out of the CVA last week, hopes were raised that the club were well on the way back to relative financial security. Lower gates won't help. David Brown scored the only goal of the game this afternoon but it was a class header. Asked to describe the goal, Brown told BBC Hereford and Worcester: "It was a great ball in from Trav, and fortunately it went in the top corner. It was nice to get a goal in the first half. "Maybe we weren't as attractive today as we have been but we got three points, we got a win. I think we would rather take than playing well and losing." However Brown admitted that the Seadogs had quite a few chances. "Gould made quite a lot of good saves," he said. Meanwhile although the attendance at Edgar Street was disappointing compared with the same fixture last year, it was still nearly 600 more than turned up to watch Kidderminster this afternoon. Johnathan Gould was the star of the show as Hereford United defeated Scarborough 1-0 at Edgar Street this afternoon. He made a number of fantastic saves throughout the afternoon to keep the Bulls in the lead. The result sees United move up one place in the league to fifth. Graham Turner made two changes to the side that ended Gravesend's unbeaten run last weekend. Ryan Green missed out with an abdominal injury and Lee Mills was rewarded for last Saturday's performance with his first start for Hereford in place of Adam Stansfield. Tamika Mkandawire failed to overcome a hamstring injury and Rob Purdie is still out injured. United didn't cause Scarborough any problems in the defence before the opener in the twenty-seventh minute. Chris Senior hit the post from the edge of the box after a corner in the tenth minute before Neil Refearn shot just wide from the edge of the box.. The ex-Barnsley midfielder went close again from twenty yards after a throw in from the right. Gould made a good save tipping a thirty yard volley away from Scott Kerr after the ball was cleared by Tony James. David Brown netted with a brilliant header from fifthteen yards midway through the first half. Simon Travis delivered a perfect cross for Brown, who superbly headed into the top corner. Man of the match Gould kept the Bulls in the game minutes later. He made a brilliant diving save to deny Redfearn, whose shot was destined for the top corner. Mills went close to doubling the lead. Mark Robinson, deputising for Green, started a good move through the midfield, and Brown crossed for Mills at the front post, but he flicked the ball across the goalface and it went wide of the far post.. Brown was denied a second by Leigh Walker in the Scarborough goal when he controlled Robinson's cross and shot towards the bottom corner just before half time. Jamie Pitman struck a half volley from the edge of the box that seemed to be going over Walker, but the 'keeper managed to get a fist to the ball and keep it out. Williams had a shot deflected wide before he forced a good save out of Walker. Mark Hotte should have equalised when he met a corner from the right, but he somehow managed to direct his header over. Redfearn broke the Hereford defence with a cross field pass and found Senior but Robinson managed to get back and make a good challenge in the box. United then made their two subs in quick succession. Graham Hyde replaced Pitman after Brown had been taken off for Stansfield. Senior hit the woodwork for a second time of the afternoon when he broke from midfield and let fly with a powerful effort that hit the top of the crossbar. Stansfield glanced a header wide from Williams' free kick as Hereford looked to put the result beyond doubt. Boro would have equalised had it not been for an awesome double save by Gould late on. Tony Hackworth hammered a twenty-five yard effort that Gould palmed away but it fell straight to Senior unmarked in the area. He looked certain to score, but amazingly Gould sprang up off the ground and got his fingertips to the ball and diverted it wide. Mark Hotte, previously booked for dissent, was shown a red card in the eighty-nineth minute. Stansfield ran onto a long ball from the defence but was brought down by Hotte who was shown a straight red card for the offence. Williams went close from the resulting free kick, but Walker tipped the ball away from the top corner. The 85 away fans in a crowd of 2,874 may feel that their side should have at least got a point, but Scarborough didn't take their chances, and Hereford did. The Bulls showed off some of their brilliant attacking football, but before they scored Scarborough's defence had little to do. The result is exactly what Graham Turner would have been hoping for; a home victory and a clean sheet. HUFC Team: Gould, Travis, Robinson, Tretton, James, Smith, Pitman, Stanley, D Williams, Brown, Mills. Subs: Hyde, Scott, A Williams, Carey-Bertram, Stansfield. SFC Team: Walker, Baker, Hotte, Cryan, Nicholson, Senior, Thompson, Kerr, Redfearn, Pounder, Hackworth. Subs : Lyth, Formann, Gilroy, Foster, Gil. David Brown says it's important to win todays game against Scarborough. Opposing teams at Edgar Street are using stifling tactics and the Seadogs are likely to follow that approach. Brown, who has scored three Conference goals away so far this season but none at home, feels goals will be harded to score as other teams will have tightened their defences. "I think it's inevitable this season that myself and the rest of the team will find it more difficult to score goals," Brown told the Evening News. "Last season we were sometimes beating teams easily, scoring four, five, six, seven goals in games. We knew it would be harder to create chances because teams will start putting everybody behind the ball. "It's more difficult for teams when they are at home because the onus is on them to come out. But at our place, teams are coming at us, frustrating us and wanting to spoil the game. "We will just have to adapt to the way visiting teams play. I'm sure our home form will come good and I'll get among the goals. We have lost our last two games and the crowd have become a little bit anxious. "It's important we get a good result against Scarborough. We have been working in training to combat what they are going to do. We've just got to go out there and put pressure on them. "Confidence is really high after the win at Gravesend. It was a massive win for us and so important after the defeat to Halifax." Johnathan Gould, the Hereford United goalkeeper, spent some time in New Zealand during 1989. He played several games for Napier City Rovers. Bulls News has received an e-mail from Kiwiland about his time with the club and how he was sent off in one match. 2-1. Gary Parker played up front that day. meant you'd won the League. career is over in the UK. Graham Turner has told the Evening News that the Bulls must get their home form on track tomorrow against Scarborough. "We have got to take control of the game and assert our influence early on. Like most teams, Scarborough are very organised and they have made a decent start to the season. "But if we perform in the same manner that we did in the second half against Gravesend then we should get a good result. That was as good as we've played since the end of last season. "It's important that we get our home form back on track. We gifted the game to Halifax and it's vital that we learn from the mistakes we made." Turner praised both Tom Smith and Craig Stanley, whose 78th minute winner on Saturday was his first league goal for the Bulls. "Tom did well for us and had a very good second-half. He had a long spell in the team at the end of last season and has a good future. "I was pleased for Craig when he scored. He's technically very good but when he came to us from Telford he had to adapt to a different style of play and he's done that." The away game against Woking scheduled for April 30th is expected to be moved to Tuesday April 19th, assuming both sides agree. This will mean a mid-week trip for Bulls supporters to Surrey. According to Confguide.com the final day of the Nationwide Conference season was originally set for 30th April, with promotion play-offs starting just a few days later. A month ago the Conference announced that these games would be rescheduled, and that the season would now end on Saturday 23rd April. Hereford United entertain Scarborough tomorrow in a match which Graham Turner will want his team to put in a much better home performance after two defeats against Stevenage and Halifax respectively. Last season Hereford defeated the Seadogs 2-1 in the corresponding game, one week earlier, with goals from Michael Rose and Paul Parry in front of 4850 spectators. Nicky Henry is manager at the McCain Stadium this season, ably assisted by the 38 year-old Neil Redfern. Captain is 23 year-old Scott Kerr, who incidentally was subbed last week against Exeter. Henry himself was banned from the touchline near the end of that game for a difference of opinion with the fourth official. Redfern could be a danger to the Bulls defence. An attacking midfielder, he has scored five goals in this campaign to date. He has plenty of experience as he spent time at several top clubs including Charlton who paid around £1m for his services from Barnsley. He joined the Seadogs at the start of the season. Steve Barker, an ex-Middlesbrough centre half, is a doubt with an ankle injury that he picked up last week against Exeter City but at least the Bulls won't be facing giant defender Matt Redmile as he has left the Seadogs. Hereford United will be without both Rob Purdie and Ryan Green tomorrow. Purdie is still suffering from several ailments and Green is said to have abdominal problems, although it is being suggested that it may be that he needs a hernia operation. Green is due to see a specialist shortly. Mark Robinson could be back in the side, and Tamika Mkandawire may also be back in contention as his hamstring injury is said to have improved although there is the possibility that he will be held unitil the Aldershot game next Tuesday. Adam Stansfield, who was subbed last Saturday, is also said to be available. Graham Hyde could also be back on the bench as he has recovered from his illness. Please Note:Supporters are asked to try and have the correct change to speed up the process of getting into the ground. Hereford based Westfields play Carlton Town in the first qualifying round of the FA Cup on Saturday. However with the kick-off at 3pm it seems likely that Hereford United's attendence at Edgar Street for the Conference Game with Scarborough could be slightly dented. Westfields play at the allpay.park which is just a couple of hundred yards from Edgar Street. 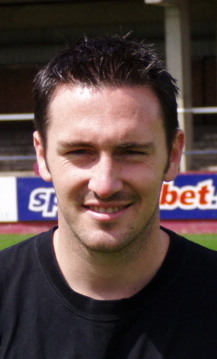 Amidst Westfields squad are several former Hereford United players including Matt Beale who made one appearance for the Bulls in the 1999/2000 season Jon Hill who played four times during 1998/1999 and 2002. Both these players were YTS at Edgar Street. Paul Burton played for the Bulls five times between 1989 and 1992 and scored a goal as well. Also with Westfields is Sam Bowen who had a spell at Forest Green Rovers last season during which the Bulls defeated them 7-1 at the Lawn. Westfields are currently joint top of the Midlands Alliance. With Cardiff City in crisis and Mark Hughes taking on the Blackburn managership, what effect will this have on Paul Parry? Cardiff City are bottom but one of the Coca-Cola League Championship. They recently sold Rob Earnshaw to West Bromwich for around £3 million, but are known to be well over £20 million in debt. The Bluebird's gates have fallen with only just over 10,000 spectators watching the game against Watford on Tuesday evening when Cardiff were defeated 3-0. Lennie Lawrence, who tracked Paul Parry for several weeks before making a reasonable offer to Hereford United for the winger, is thought to be on his way out of Ninian Park unless results very quickly improve. Cardiff fans are asking for a replacement for Earnshaw but there are no signs of anyone being lined up as yet. Sam Hamman, the owner of the club, appears short of liquid funds. Although his club is hoping to move to a new stadium in a year or two, the problems with funding the project couldn't have come at a worse time. Meanwhile Mark Hughes, who brought Paul Parry into the Welsh squad, will only be in charge of the Welsh team for two more games. Parry may be lucky to make it onto the bench as the vast majority of the top Welsh players won't want to miss the games against England and Poland. Nevertheless, Hughes praised after his early appearances for the Welsh team. 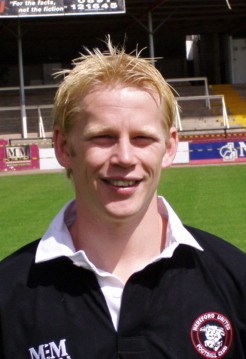 Parry first played for Wales against Scotland on February 18th. Talking after the match to BBC Wales, manager Mark Hughes said: "It was a great introduction. He looked very comfortable out there. I saw him at the weekend and he played very well so I didn't have a problem putting him in tonight. It was a little bit earlier than I thought, but he did very well. "He is a tough lad, I have seen that. But I wanted to know whether he has the mentality for this higher stage, and he showed he did. "He surprised me. He is a young man with no real experience in professional football and he showed skill and confidence out there in front of 47,000 people. "He showed me he could make the step up and I was delighted with him. It's some big jump from the Conference, but he has certainly given me an extra option." It already been suggested that Hughes could do worse that try to take Parry to join him at Blackburn. If that happened it has been reported that Hereford United would receive 10% of any deal. Whether Parry would want to leave Cardiff City is another matter, but when a club is in trouble players are often sold to make ends meet. That used to happen at Hereford United. It doesn't now thanks to prudent financial management.